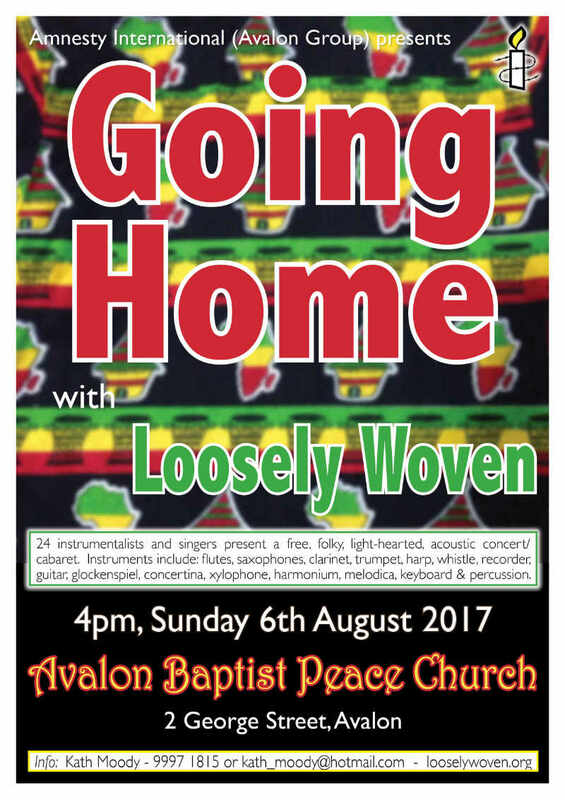 FREE CONCERT in AVALON – SUNDAY 6th AUG. 4 p.m.
Wayne Richmond, the leader of the group, is one of the Peninsula’s inspirational leaders in giving live music to the community . Wayne and his musicians have been contributing to Amnesty’s great work for more than 20 years and helping those who suffer injustice ,unfair imprisonment , torture, execution and other human rights abuse. GOING HOME is named from the opening song from Dvorak’s New World Symphony. Most of us are human rights supporters and will love to hear Australian singer Sissy Higgins’ heart-rending song ‘Oh Canada’ written in response to the tragedy of Syrian refugee Alan Kurdi whose 3 year old body was washed up on a Turkish beach after he and his family attempted to reach a Greek island on their way to Canada. Graham Moore’s song ‘New Frontier’ celebrates all those who struggle to build a better world. ‘Anchor Me’ is a New Zealand song adapted by Greenpeace to commemorate the sinking of the Rainbow Warrior in 1985. Great songs for a human rights concert! Amongst the performers this time is a young man from Tanzania who has taught the group two of his own songs. refugees and asylum seekers; indigenous people, many victims of unjust treatment; those at risk of torture and execution;and to gain human rights for disadvantaged people all over the world. Date: Sunday 6th Aug. 4p.m.